In the Workforce Unlimited Premier Division, Pointon sit comfortably in top spot after putting three past Coningsby. Goals came from Thomas Buckberry, Ian Jacquest and Sean Taylor. Benington moved into second after a close 3-2 win at Old Leake. Down in the bottom half of the table, Wyberton Reserves took the three points after a close 3-2 win at Billinghay Athletic. Fulbeck United left struggling Fishtoft with a 1-0 win while Railway Athletic and Ruskington Rovers played out a 1-1 draw. Skegness Town Reserves and Leverton played out a 2-2 draw while Spilsby Town and Swineshead Institute shared the honours in a 3-3 stalemate. Only two games were held in Division One this weekend, with both being away wins. Horncastle Town won 3-1 at Sibsey whilst Old Doningtonians found the only goal of the game at Swineshead Reserves. In Division Two, Fosdyke keep up the pressure for promotion after a strong 5-1 win over Boston International. Scorers on the day were Alex Cammack, who netted a hat-trick, Ashley Davis and Declan Sands. Railway Reserves travelled to struggling Boston Athletic and left with three points in a 3-1 victory. FC Wrangle beat Coningsby Reserves 2-1 and Holbeach Bank thrashed Caythorpe 6-1. In Division Three, Eagle United ran away with the three points at Swineshead A after putting 13 past the home side, winning 13-2. 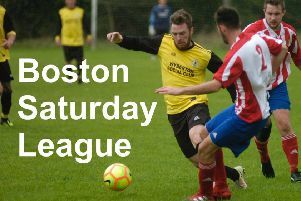 In-form Benington Reserves kept up their good run after a 4-1 win away from home at neighbours Leverton Reserves. Mareham United put up a fight against Fosdyke Reserves but were just pipped at the post, Fosdyke winning 3-2. Skegness Town A left Digby with a 4-0 win while Spalding Harriers netted four at Old Dons Reserves, winning 4-2. In the Target Newspapers Challenge Cup, Divison Two Park United pulled off great 3-0 win over Division One side JFC Seniors. Skegness United won 5-1 at Colsterworth, whilst Kirton Town won 2-1 against Friskney. FC Hammers put up a fight at Woodhall Spa United, but Woodhall came out on top in the end with a close 2-1 victory.